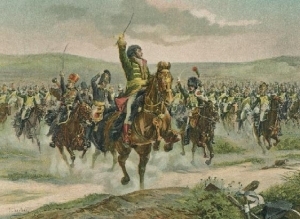 The evening of Jena - Napoleon rides past captured Prussian colours. In the aftermath of Frederick the Great's great military victories, Prussia's military reputation was unrivalled. Unfortunately, reputations do not win wars. Although the Prussian army was well trained in the tactics of the day, its failing lay in the fact that the Prussians did not have a military leader to match Napoleon - the greatest military mind of the age. To make things worse, Prussian commanders could not even agree on a plan of action. Lack of an overall plan, combined with command and control failings would lead to Prussia's downfall - however, no one could have predicted the swiftness of that defeat. Austria had been defeated at Austerlitz in 1805. Although Prussia had been tempted to enter into the war of the Third Coalition against France in 1805, it had not done so in the hope of gaining French-occupied Hannover as a concession. However, the Austrian defeat left Prussia isolated in Central Europe. Sensing opportunity, Napoleon demanded and obtained the Prussian territories of Cleves, Ansbach and Neuchatel. In return, Napoleon offered Prussia Hannover - but the treaty had not been ratified. More humiliation followed - the formation of the Confederation of the Rhine threatened Prussia's control over German affairs. The final straw was Napoleon's offer of Hannover to Great Britain in return for peace. Napoleon had gone too far - Prussian honour was at stake and the army was mobilised on 10 August 1806. The Prussians had 2 divisions posted near Schleiz (under General Tauentzien) and Saalfeld (under Prince Louis Ferdinand). These were easily brushed aside by the French I and V Corps respectively as they came out of the Thueringerwald. At Saalfeld on 10 October, Prince Louis was killed in personal combat with Quatermaster Guindet of the French 10th Hussars. The Prussians fell back and were ordered to concentrate around Erfurt/Weimar area. The battle began in the early morning of 14 October. The battlefield was on a ridge (the Landgrafenberg) northwest of Jena. Lannes V Corps was ordered to attack at 6.30am in order to win more space on the ridge for the other French corps converging on the battlefield. Lannes' attack was spearheaded by Suchet's 1st Division on the right, and Gazan's 2nd Division on the left. These initial moves were centred around the villages of Cospeda, Luetzeroda, Closewitz and Vierzehnheiligen. Murat leading the charge at Jena. However, by mid-morning, the bulk of the Prussian forces were on the field. 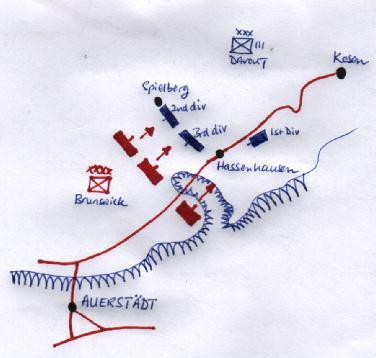 The fighting centred around the villages of Spielberg and Hassenhausen. Davout took a risk and placed 2 Divisions around Spielberg leaving only the 85th Line Regt to watch Hassenhausen. Fortunately for him, the Prussian main assault was directed against Spielberg. Fierce fighting developed around these 2 villages. At one point, the hopelessly outnumbered 85th Line broke and fled - but was rallied by Davout himself and pushed back into the line. During the fighting around Spielberg, the Prussian commander, the Duke of Brunswick, was killed. This left the Prussian army in the hands of the inexperienced King Frederick-William III - who was overawed by the erroneous belief that he was facing Napoleon in person. By 11am, Davout's 1st Division arrived on the battlefield. These were directed to reinforce the exhausted troops at Hassenhausen. Prussian assaults were repelled. The main Prussian armies had been defeated. Remaining Prussian forces were scatterred all across Prussia. The remainder of the campaign was basically a mopping-up operation. By 27 October, the French entered Berlin - with Davout, the hero of Auerstaedt - at their head.